I think the trouble with this advent calendar is that it isn’t very christmassye. i mean we all noe the Snativity is the ultimate christmas story, but so far we’ve been in space and eating poo’s and there’s been a bucket of wee etc. we should have more christmassey things happenign m8s. Sod it./ I’m not even going to do this any more. I’m sick and tired of it. You noe? Every day I tell you all about what’s happening on the advent calendar, I thort i was doing everyone a favour by getting a calednar for us, but i don’t think anyone’s really arsed about it. our advent-ure is over. i’m going. Bye. this is me walking out of the stable where snattas’ sley is. this is me going. bye then. grump. dunno why i bother sometimes. not very christmasey and i bet everyone stopped reading after the first few. grump. gosh it cold out here. i… wait! what that in the sky? Oh! it that big star! That big star that was coming, before! it’s nearly here now! look at it flying over the hills of lapland where the sley is…. I KNOE WHAT THIS IS! I didn’t think they’d do this bit! This is the BEST BIT of the whole snatatvity! but they usually just draw the bit in the stabel for calendars and we don’t get to see this! EVERYONE! come out here and look at this! This is the BEST CHRISTMAS BIT!! 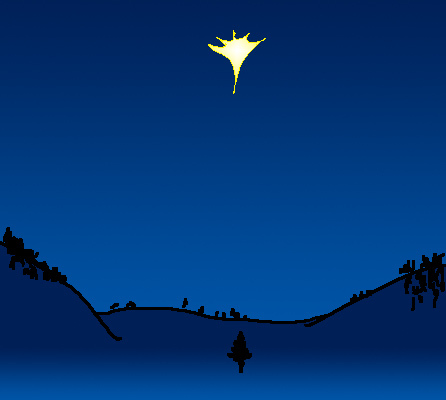 look at the star! It’s such a strange phenomemun that nobody can explain it, not even the elfe’s! Look, it so strange, that even tho it a star, it cast’s a shadow! See look, see its shadow on the ground under it?